It took us nearly 30 minutes to receive our drink order and my friends drink was made incorrectly and both martinis were lukewarm by the time they got to our table. I asked for blue cheese stuffed olives, they never came despite our server telling me twice she was going to get them. We had to chase our server down because she didn’t ask my husband how he wanted his steak cooked. His steak was very overdone; he asked for medium and the blue cheese sauce on it. It came out well done, no sauce, no steak knife and the steak was about 3/4 inch thick (he ordered sirloin). Our food took a very long time to come out (which is understandable, it was a Saturday evening) however our food was barely warm by the time we got it. We had to ask for silverware. All in all it was a really bad experience. Any one or even two of these things would have been no big deal...but every aspect of our meal left a lot to be desired. Bad service and terrible food. We’ve been there a few times before and food was great, that’s why we decided to go back. However after this, we likely won’t go back. We don’t go out enough to chance another bad experience. Even though we had a reservation we waited over 45 minutes. 1) We were never offered water by our waitress (and when we did ask, they were brought two at a time, with about a 5 minute gap between the two deliveries. 2) It took about 30 minutes from the time we sat down before the waitress took our order. 3) After we ordered, it was about another 45 minutes until our food actually came out. I get that the restaurant was busy, but there was plenty of food being delivered to other tables. To top it off, we barely saw our waitress during the wait, to update us on the status of our food or check on drinks. 4) Once we were finished eating, we had to flag down the waitress to get our check (we'd been done for 10-15 minutes at that point), and then it took another 20 minutes for her to bring the check (we had to flag her down again to remind her - she'd forgotten). Overall, not a good experience; the food wasn't nearly good enough to make up for the inexcusable service. The Asian chicken appetizer was outstanding! Service was perfect. The reservation is not a reservation at all. Had we known that we wouldn’t have wasted the effort of driving here. You check in and just get a spot right after whatever random person walked in right before you. We waited for 30 mins and were seated after people who walked in behind us (people who had no reservation). Not the experience I have ever had with an Open Table reservation. I didn’t have a good experience. My dinner came out without the sauce on my chicken an was dry. The waitress was busy but I wasn’t satisfied with the experience . We had a great time celebrating together. Our server was prompt, and our food and drinks were delicious! They accommodated our group very well! Highly recommend! I enjoyed the beer sampler, but after drinks and salad were served the service was very slow. The server was attentive, the salads and drinks were fine, but the kitchen seemed very backed up. I have some sympathy on Friday evenings, but the weather was bad and there were several tables near us that were never sat or no one came after the last party left - I truly think it would have taken an hour from ordering to having the food at the table for a couple of steaks if the restaurant were at capacity. If I had been trying to make a show at the movie theater across the street I would have been extremely frustrated (and possibly late). Truthfully, my steak wasn't that great when it came and it was missing the blue cheese sauce, but I wasn't about to complain for fear of it taking all night. My husband did enjoy his steak (he had the ribeye and I had the sirloin). The manager did speak to us and gave us a credit towards our meal, so that saved them from a completely awful review. I had originally tried this restaurant several years ago and had the same problem with slowness (different time of day and different entrees). I thought if they were still in business after a few years, they must have fixed the slowness, but I guess not. Must have been a reason I could get a last minute reservation on a Friday night. I would go back if someone else suggested it and we weren't in a hurry, but I probably won't choose it myself again. Excellent service, great menu options and food was fresh, delicious and a great value! Dinner and drinks for 5 for $105!! Great food, great service (forgot her name), it's a little bit overpriced but still good. We will make it back. The blackened salmon sandwich is really good. The veggie burger is also very good. The service was wonderful and they even moved us to another booth when we asked to be moved away from a loud party. They were considerate in every way. It was awesome! 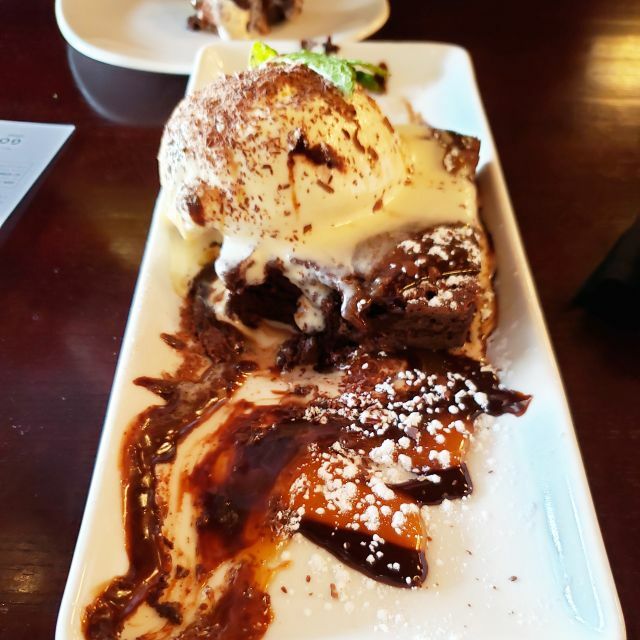 Our Server, Alex, was definitely can-do! Love his attitude, we asked, he said done! Thank you! Family dinner & 1st time my teenagers had been there. They LOVED IT!! Promptly seated upon arrival. Waiter was great and checking in often enough that we always had water/drink. Food delivery seemed a bit slow; for only 2 people ordering a burger and salmon, it was close to 40 minutes and the place wasn't very busy. Food was very good and at a temperature that indicated it hadn't been sitting for awhile. We arrived a few minutes before our reservation time and were promptly seated. However, it took over 30 min for our food to arrive and then one plate didn’t match the description. It tooo another 15 min (45 min total) for that to arrive. Then we have to eat fast due to another commitment. No apologies or explanation given as to why it was so slow. The food was great, the service was ok. I always get stuck in the back of the restaurant which is not a great spot to be. Very noisy and staff rushing around. 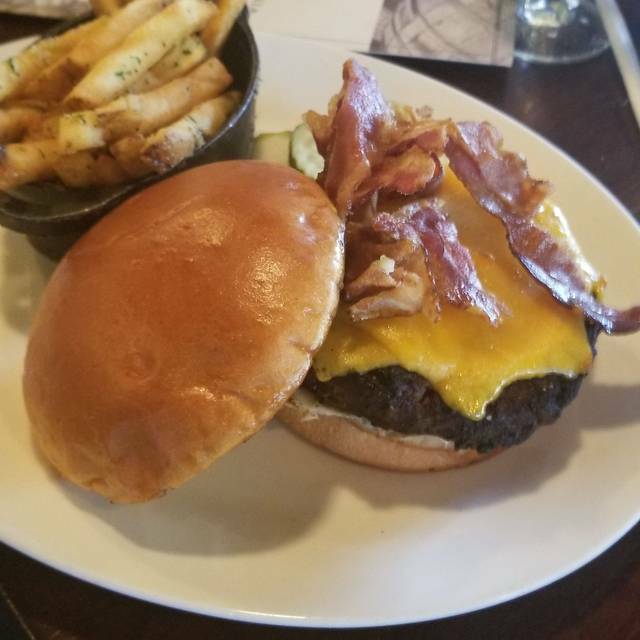 We first visited for KC Restaurant Week and really enjoyed it, so we went back to celebrate our anniversary. Because it is right next door to the AMC, it was perfect for dinner and a movie date. The food, drinks and beer were all very good. Their happy hour specials are also nice. The “passport” rewards are also a nice touch. It’s like getting an ongoing 10% off. Alex was an amazing server and the kitchen did a great job at cooking our meal! Service was not good, food wasn't correct as ordered, and it didn't come out at the same time, (4 of us). The staff there is so kind and helpful and did a great job taking care of us. The food was great! Thank You! Wonderful service. Very friendly and professional. Layout is creatively thought out. Great place, with great food and outstanding service!!! The waitress was the best I have experienced in a long time . She relished every opportunity to give above quality service. And noticeably enjoyed her job. My wife and I made reservations. Upon arrival we’re offered a place at the bar. I don’t mind sitting in the bar area, but not with reservations. Once seated, we had two people help us before our actual server showed up. Which may explain why the host tried to sit us in the bar. Our meals then came out before our salads. All of this will not detour us from GB in the future. But they were not clicking on this night. The food and service was amazing! It was a wonderful relaxing lunch. Second time back to this location. Food and service were excellent. Noise level was just right. We had a reservation at 7. When we got there, they said they couldn't set us until 7:30. We couldn't wait that long, so we left. Excellent food and service. Everything was very flavorful. I would highly recommend it. Had a good menu for restaurant week, however, the chicken I ordered was cut thin and very dry. It is on the regular menu also so not sure if this is how it comes all the time or not. I went there for restaurant week. The waitress was awesome, but the timeframe to get food out was horrid (little over 1hr). Not only were the mash potatoes cold, but they gave me a butter knife to use with my steak. Definitely will not be returning! We went during restaurant week. The portions were huge and the food was good. It seemed like everyone’s steaks were over cooked from what we ordered but they had good flavor. They forgot to bring our desserts out and the ice cream was all melted and they didn’t even offer to replace it or bring us new plates. Really enjoyed our meal!! Fun to see twilight wcome about with the bar shining, lights dimming and outside ambiance. Swing by during restaurant week, the full menu is available, and the restaurant week menu offers several nice choices. Food was really good. The bread pudding was delicious. The service was wonderful. Salmon for dinner came out raw to begin with and when came back second time was burnt to crisp. Other meals luke warm. Sunday evening. Not very busy . Wait staff apologized and and tried to correct but not worth another try. 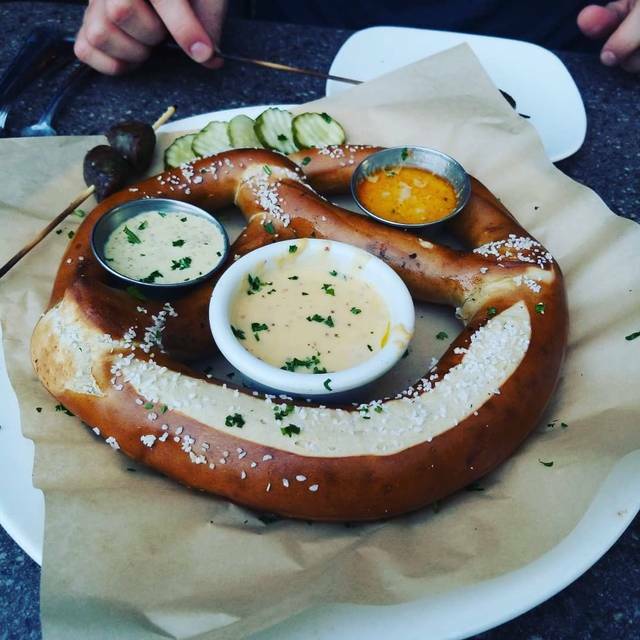 The food ate Gordon Biersch was always excellent when the restaurant first opened. The last couple of times we have tried this restaurant the food has been lacking. The food is always great, love the tacos, ribeye is a great choice, lobster and shrimp Mac cheese is great, it's a 45 minute drive but we'll worth it.